Last weekend I have been to the farmers market and could’nt resist myself in buying these.. But J wanted something different. I had this recipe bookmarked long back and wanted to surprise him. 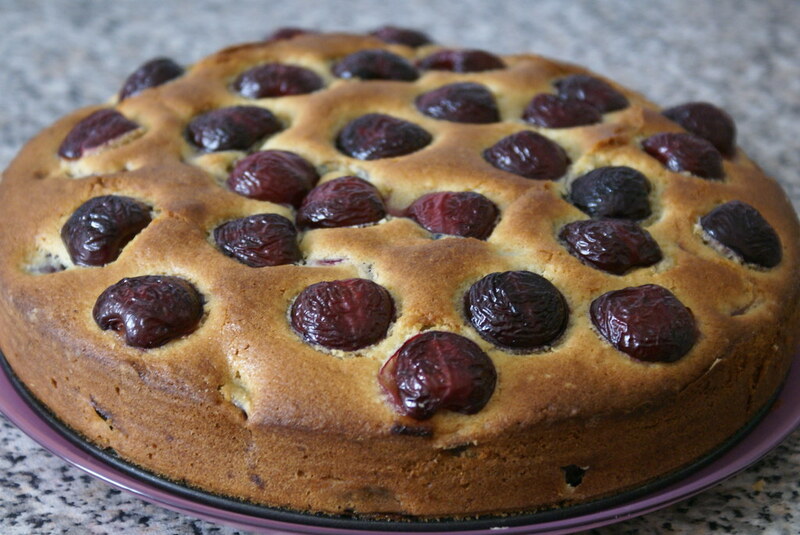 Separate around 15- 20 cherries (to be placed on top of the cake). In a separate bowl beat together butter and sugar till light and fluffy. Then add eggs one by one and beat till pale yellow. Add the milk and vanilla essence and beat till incorporated. Add the flour mixture and with the help of a wooden spoon or rubber spatula, mix well. Gently fold in the cherries (not the 15 cherries which were separated). Pour the batter into the prepared pan and smooth on top with the help of the spatula. Bake for 15 mins. Remove the pan and quickly arrange the cherries on top, with cut side down. Put back the cake in the oven, and bake till done, for about 30 to 40 mins. Or till toothpick inserted into the cake comes out clean. 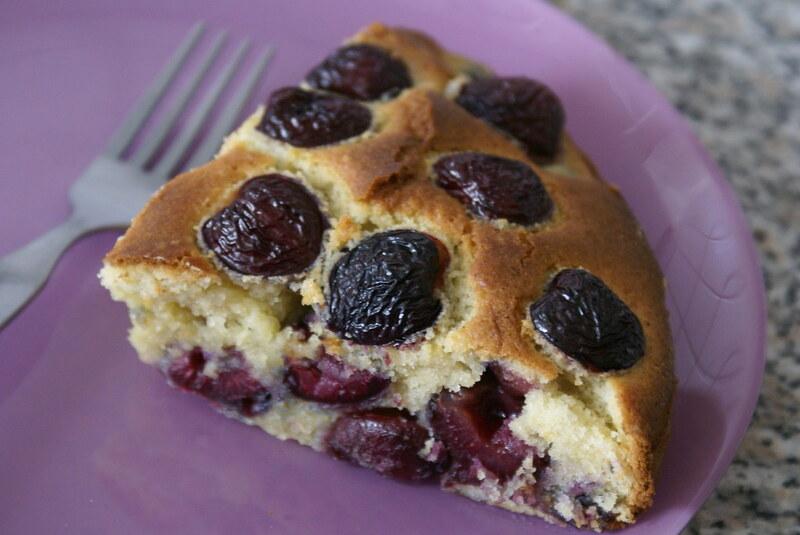 Hi, ur cherry cake look delicious. I made ur mirchi bajji, they turned out very tasty and yummy. Wow..the cake looks so pretty! 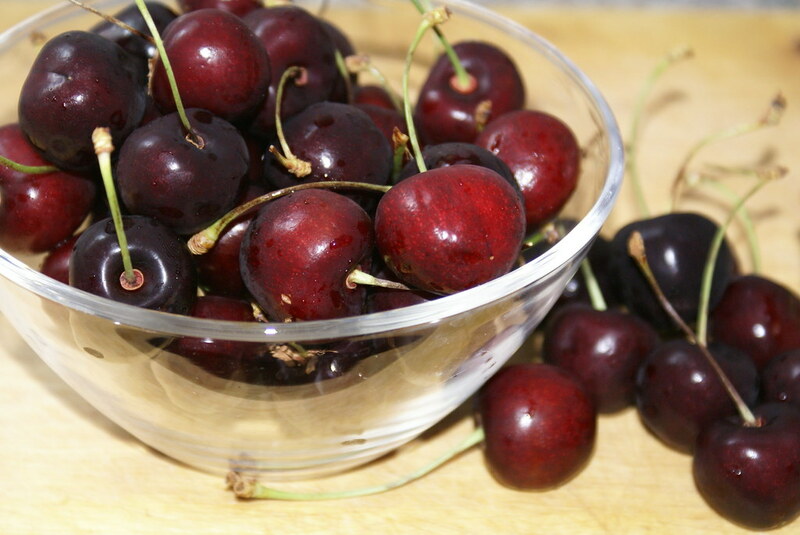 !and am sure delicious as well..cherries makes anything tasty right?! !The cake looks exactly like the one in JoB.Great job!! Great polka-do design 🙂 And the cake looks deliciousssss! nice cake cinnamon, like a clafouti or something. Pretty! I like this cake. Your moog dal dosa sounds different. I am going to try it soon. looks lovely.. the red polka dots on top, and the circles in the cake as you bite:-) cool…. slice of the cake does looks yummy….